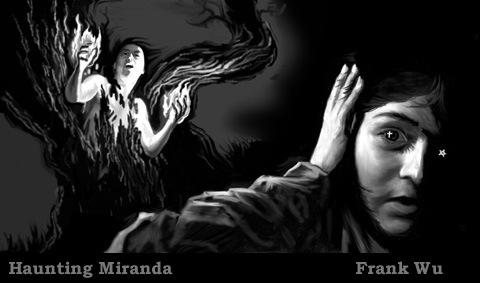 This illustration was done for Pam Chillemi-Yeager's story "Haunting Miranda," which was published in Issue 10 of the now defunct semi-pro ezine E-scape. In the story, Miranda is haunted by a demon lover, who comes bursting out of a tree, spouting professions of love. Miranda kinda likes him, too, but knows he comes from the wrong side of the Gates of Hell. BTW, the guy in the tree looks a little like me.